Looking for some knowledge on replacing the wiring/pots on old Love Rock's. The neck volume pot doesn't really roll off nicely, so I figured I'd raplace the pots with new ones. I've found a local guy who sells pre-wired wiring harnesses. He can do the full thing, vintage style, braided cable, short shaft 500k cts pots, orange drop caps. Reading online these things seem to be a popular choice, and I think the consensus is short shaft pots are the way to go. 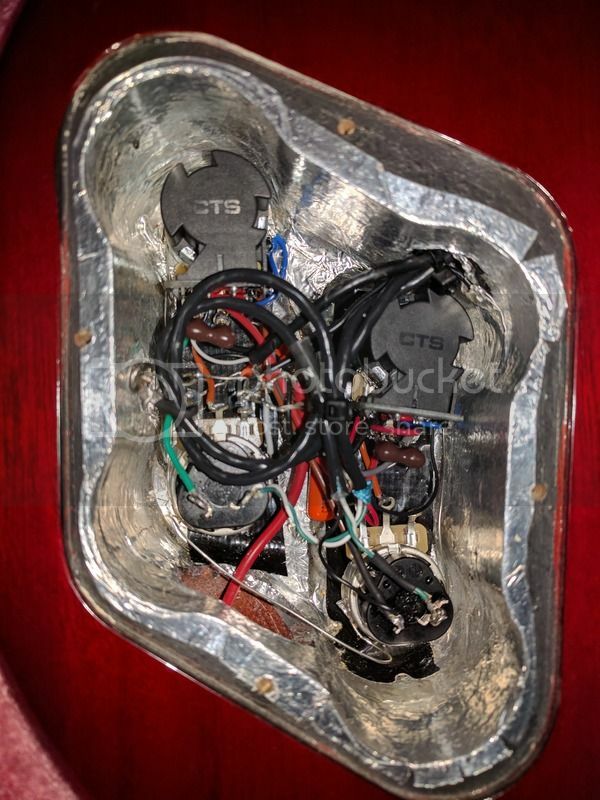 I have several 50's Vintage wiring harnesses in stock including a standard CTS harness (4 X 500K pots) and a push/pull harness in the event that you have 4-conductor pickups (which I doubt given the vintage of your guitar however it's possible that they could have been upgraded over the years). The price for either harness is $75, plus $25 for a prewired 3-way toggle switch (recommended if you haven't changed it out in a while). You can go with either short shaft or long shaft pots however the upside to long shaft pots is that you can adjust the height ensuring that you get all the way through the cap, whereas with the short shaft pots all it takes is an extra 1/16" difference in the thickness of the cap and they're too short! I've run into issues in the past with Tokai's and Burny's where there wasn't enough of the shaft sticking through on the top side to allow for the dress washer and nut. As mentioned on my website, when in doubt, go long! And yes, you're likely going to have to drill out the holes ever so slightly to accommodate the 3/8" CTS pot shafts. Does anyone have experience with having short shaft CTS pots not being long enough like he mentions? Food for thought.... linear taper pots have volume roll off from 10 -1. Standard audio taper pots roll off dramatically from 10 - 5 or so and then volume silence. I go with linear taper on the volume pots and keep the tone pots audio taper - tone roll off is still 10 - 1. Short shaft pots have always worked for me on Tokai's. But like you said below, you can use long shaft and adjust the height as required. Yes, in most cases, you'll need to drill out the holes slightly to accommodate the US/Imperial wider shaft diameter. Yeah this stuff is confusing. Linear vs Audio taper. The bridge volume pot rolls of nicely. I can roll it down and it cleans up and there is a good range of different tones/volume pretty much through the whole sweep. The neck volume doesn't do the same. It comes in at about 2 and then from 2-10 there is a slight increase in volume but not much difference in the way it cleans up or changes the tone. 1. The prices quoted seem pretty high. I appreciate that a pre-made harness takes a lot of hassle out of the equation but guitar electronics are extremely basic and you could probably save a considerable sum by sourcing and fitting the parts yourself. Heck, shop around and you may even save money if you get a tech to do it for you. 3. CTS now make metric pots that don't require drilling out the holes and don't require new knobs. Did your guy mention that CTS pots won't take standard Tokai knobs? 4. It's not as simple as linear VS audio any more. Nowadays with increased awareness of the Centralab pots used in vintage guitars you also have Vintage/Custom/Special taper pots to consider! Many of these are specially commissioned by big retailers like Mojotone and CrazyParts, which are stamped on the bottom of the pot body, but they are all pretty similar: they run at a 20-30% taper rather than the 50% you get on a Linear or the 10% you'd see on an Audio. These pots are a nice middle ground between the two standard types and work particularly well on volume controls, giving a nice smooth rolloff without the 'jump' you often get around the halfway point of the pot rotation. I would still stick with standard audio taper for tone controls though. 5. CTS also make pots with different torque, i.e. friction when turning. Do you want the pots to offer a bit of resistance so they stay where you put them, or have them smooth and slick so they are easy to turm? 6. You may want a vintage taper pot in metric short shaft with low torque, and you may find that CTS don't make that combination. Fortunately you can buy two, tear them apart and make a Frankenstein pot! Here's my effort - volume controls are CTS DPDT push-pulls with Mojotone vintage taper short shaft imperial (drilled out) pots. Tones are CTS SPST push-pulls with standard audio taper short shaft metric (no drilling) pots. The orange drops are the 715P series (polypropylene, 5% tolerance), not the cheaper/more common 225P's (polyester, 10% tolerance). The push-pull switches are coil taps, out of phase, and master series i.e. the Jimmy Page scheme. Thanks for the info, appreciate it. 1. I'm not too fussed about the price, I'm sure I could get it all cheaper like you say. I'm from Canada so it is going to be more than what some other countries pay. I don't mind supporting local business. 2. Do you think that going with long shaft will be fine and can be adjusted like he said? This would remove the possibility of the short shaft not being long enough. 3. I'll ask him about metric pots. Something tells me he does not have metric pots ready made to order but maybe he could get some, or maybe I could get my own. I definitely don't want to have to get new knobs, I want to keep the originals on for sure. As for the tapers, there seems to be a lot of different options. I'm just a hobby type player and so I don't see myself being too fussy here. Something standard will probably do me just fine. I'll look into what you mention though. It won't do any harm, in fact I had that setup in the days before CTS made the variety of guitar friendly pots they do now. It looked wierd but obviously had no impact on performance. Honestly though? I think he's way overstating the risk. Your guitar has short pots now and they fit fine. And if you go for the metric size, I think they only come in short fit anyway. Cool. Sounds like short shaft will be fine. I don't want weird knobs that stick out way off the body. So he says he hasn't had problems with metric/imperial knobs. Split shaft pots are just a friction fit so you just push them on there isn't any exact threading to match up. I guess my final question would be about the switch. I don't know what's involved in replacing the switch, I'd like to keep the guitar as original as possible. Is it worth it? Does it make a difference to anything if the current one is working fine? Hmm. That's not actually true. US pots/knobs have 24 fine splines and metric pots/knobs have 17 coarse splines, with both at a slightly different diameter. Yes, it's friction fit and yes, you can force one onto the other if you want but to me that's a cowboy approach. Having done it myself I admit it doesn't really have a negative impact in day to day usage but if you take the knobs off again you can see where the mismatched threading of the splines has torn them up inside. Why not just use parts that are designed to work together in the first place? (Rhetorical question... he's got his harnesses pre-wired and doesn't want the hassle). Replacing the switch is child's play, and completely reversible (if done properly). You would notice a more solid 'thunk' as the switch changed positions but otherwise no difference. The main reason to change the switch, or the output jack (has he mentioned that one?) is reliability. On any guitar, cheap or expensive, new or old these are components that work perfectly until they don't. High quality parts just tend to fail less often. It may be wise to check what the new switch will be and, assuming it's a genuine upgrade rather than a straight replacement, check if he plans to make any permanent changes to make it fit - which would be completely unnecessary if he's installing the right switch. You're changing the rest of the electronics already so originality would not be an issue. Personally? I did it and have no regrets. For me it's not a question of quality but consistency. With pots it's also about responsiveness (torque, taper etc.). Cheap ceramic caps can have a variance/tolerance of 20-80%! Pots are around 25% IIRC, so your 500k pot might actually be closer to 400K. Orange Drop 715p's have a tolerance of 5% (225p's are 10%). Depending on the model/vendor, CTS pots can be as low as 7%. #44 was asking the question because he wasn't happy with the response of his volume pot. There's also the question of perception. If he ever goes on to sell the guitar everyone knows and trusts the CTS/OD combo, for better or worse. as to ceramics Caps, using high quality means selecting the low tol versions 5% is perfectly fine. Yes, but there are suppliers that have their own versions commissioned. Mojotone's 'Custom' taper pots run at 7%, Crazy Parts TVT pots are 9%. They are both specifically designed with the electric guitar in mind and have an unusual taper. I highly doubt the Tokai factory are using select spec alpha pots given the specs of the rest of the electronics. They are using bog standard CTS pots even on the premium series models. I reiterate that the person who originally asked the question did so because he was unhappy with the way his volume control worked. I also agree with you that there's too much emphasis on cap type when value and tolerance are the only specs that matter. I stick with OD because they are well known, relatively cheap, easy to source, and frankly they look cool. I recently replaced one of my 250K Alpha pots (OEM) on the VSB80 I have, due to a broken Knob split tang, it measured 248k, as did the other pot. the replacement pot was also within 2k of the original and of all the potentiometers I have replaced on all sorts of kit they vary very little from stated value and has always made me wonder why they state such huge tolerance percentages! I would never assume about what spec a manufacturer is using because when you purchase large volumes , spec and price become part of the deal struck from the supplier. Gibson have now started fitting OD's into their range as they recognise that OD's have become the internet forum byword for caps. the OP needs to fit the right Pot for his needs whether that is an A or B pot, CTS or Alpha or Joe Blogs, to be honest a close tol pot or not doesn't make much difference on a guitar in practice but and A or B type do. even more important is the number of splines, so the knob fits back on.